Some strong numbers, but network erosion continued. NBC: The Tuesday premiere of THE VOICE at 2.1 was down 0.6 from 2017. THIS IS US, while easily winning the night at 2.9, dropped a full point from last year’s premiere. 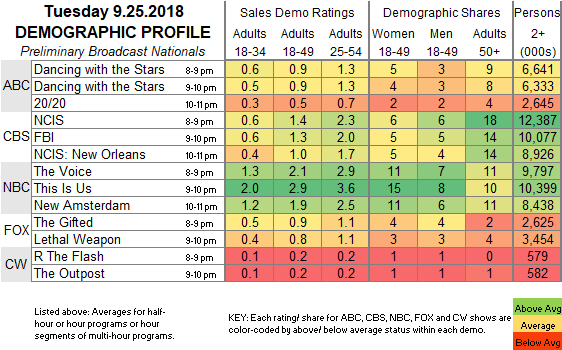 NEW AMSTERDAM did a good job holding its lead-in at 1.9 (which may come down a tick in finals since it began at 10:01PM), better than last year’s LAW & ORDER: TRUE CRIME did with a larger THIS IS US lead-in. CBS: NCIS’s 1.4 was down 0.2 from the 2017 premiere. 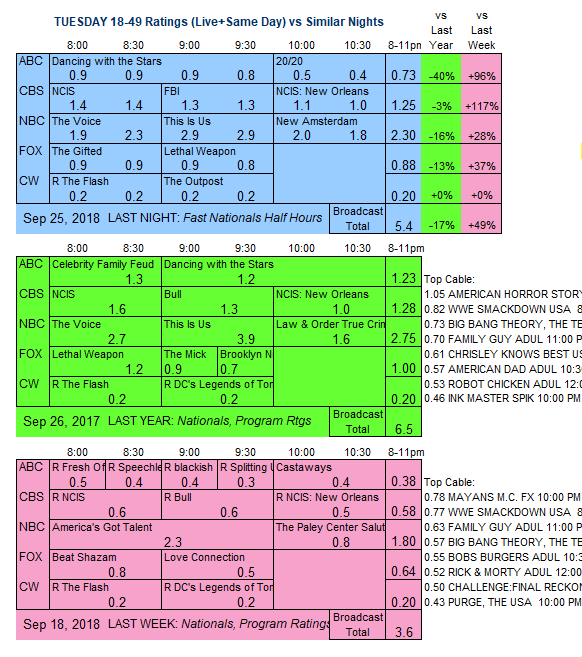 FBI launched well at 1.3, the same number as BULL’s premiere in that slot last year. NCIS: NEW ORLEANS was steady with 2017’s 1.0 premiere. FOX: THE GIFTED fell 0.6 from last year’s series premiere to 0.9, although that was down only 0.1 from last season’s finale. LETHAL WEAPON lost 0.4 from the 2017 premiere to 0.8, which similarly was steady with last May’s season finale. ABC: DANCING WITH THE STARS dropped 0.3 from last season’s Tuesday premiere to 0.9. It was followed by a special 20/20 (which was really a promo for the upcoming series THE ROOKIE) at 0.5. CW: THE OUTPOST was steady with its last new episode 2 weeks ago at 0.2. It was preceded by a rerun of THE FLASH at 0.2. ABC has tonight’s series premieres, with sitcom SINGLE PARENTS followed by A MILLION LITTLE THINGS. Season premieres include SURVIVOR, MODERN FAMILY, EMPIRE, STAR and NBC’s CHICAGO trilogy.